In American football, each team has 11 players on the field at one time. The specific role that a player takes on the field is called his position. Under the modern rules of American football, teams are allowed unlimited substitutions; that is, teams may change any number of players after any play. This has resulted in the development of three "platoons" of players: the offense (the team with the ball, which is trying to score), the defense (the team trying to prevent the other team from scoring, and to take the ball from them), and the special teams (who play in kicking situations). Within those platoons, various specific positions exist depending on what each player's main job is. In American football, the offense is the side in which the players have possession of the ball. It is their job to advance the ball towards the opponent's end zone to score points. Broadly speaking, the eleven players of the offense are broken into two groups: the five offensive linemen, whose primary job is to block, and the six backs and receivers whose primary job is to advance the ball either running with the ball or passing it. The backs and receivers are also commonly known as skill position players or as eligible receivers (or eligible ball carriers). Offensive linemen are not usually eligible to advance the ball past the line of scrimmage during a play. The organization of the offense is strictly mandated by the rules; there must be at least seven players on the line of scrimmage and no more than four players (known collectively as "backs") behind it. The only players eligible to handle the ball during a normal play are the backs and the two players on the end of the line (the "ends" or Tight ends). The remaining players (known as "interior linemen") are considered "ineligible", and may only block. Within these strictures, however, creative coaches have developed a wide array of offensive formations to take advantage of different player skills and game situations. The offensive line (on left, in orange shirts) consists of a center (with ball in hand ready to snap) two guards on either side of him, and two tackles. The center is the player who begins the play from scrimmage by snapping the ball to the quarterback. 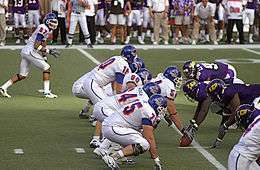 As the name suggests, the center usually plays in the middle of the offensive line, though some teams may employ an unbalanced line where the center is offset to one side or another. Like all offensive linemen, the center has the responsibility to block defensive players. The center often also has the responsibility to call out blocking assignments and make last second adjustments depending on the defensive alignment. Two guards line up directly on either side of the center. Like all interior linemen, their function is to block on both running and passing plays. On some plays, rather than blocking straight ahead, a guard will "pull", whereby the guard comes out of his position in line to lead block for a ball carrier, on plays known as "traps" (for inside runs), or "sweeps" (for outside runs), or "screens" (for passing plays). In such cases, the guard is referred to as a "pulling guard". Guards are typically shorter builds than tackles but taller than centers. Two tackles play outside of the guards. Their role is primarily to block on both running and passing plays. The area from one tackle to the other is an area of "close line play" in which blocks from behind, which are prohibited elsewhere on the field, are allowed. For a right-handed quarterback, the left tackle is charged with protecting the quarterback from being hit from behind (known as his "blind side"), and this is usually the most skilled player on the offensive line. Like a guard, the tackle may have to "pull," on a running play, when there is a tight end on his side. Tackles are typically a taller, longer build than interior offensive linemen, due to the need to keep separation from defensive linemen in pass blocking situations, as well, they tend to have quick footwork skills as they often engage against containing or rushing defensive ends. The quarterback is the player who receives the ball from the center to start the play. The most important position on the offensive side, the quarterback is responsible for receiving the play from the coaches on the sideline and communicating the play to the other offensive players in the huddle. The quarterback may need to make changes to the play at the line of scrimmage (known as an "audible"), depending on the defensive alignment. At the start of the play, the quarterback may be lined up in one of three positions. If he is positioned directly in contact with the center, and receives the ball via direct hand-to-hand pass, he is said to be "under center". If he is lined up some distance behind the center, he is said to be "in the shotgun". He can also be in between. This is called a "pistol" formation. Upon receiving the snap, the quarterback has three basic options to advance the ball. He may run the ball himself, he may hand it to another eligible ball carrier to run with it, or he may execute a forward pass to a player downfield. Running backs are players who line up behind the offensive line, who are in position to receive the ball from the quarterback, and execute a rushing play. Anywhere from one to three running backs may be utilized on a play (or even none, a situation typically known as an "empty backfield"). Depending on where they line up, and what role they have, running backs come in several varieties. The "tailback" (or sometimes the "halfback", though this term is somewhat archaic) is often a team's primary ball carrier on rushing plays. They may also catch passes, often acting as a "check-down" or "safety valve" when all other receivers on a pass play are covered. The "fullback" is often larger and stronger than the tailback, and acts primarily as a blocker, though the fullback may also be used for catching passes or for rushing as a tailback does. Fullbacks often line up closer to the line of scrimmage than tailbacks do, so they may block for them. A "wing-back" or a "slot-back" is a term for a running back who lines up behind the line of scrimmage outside the tackle or tight end on the side where positioned. Slot-backs are usually only found in certain offensive alignments, such as the flexbone formation. A similar position, known as the H-back, is actually considered a modification of the normal tight end position (see below). The wide receivers are pass-catching specialists. Their main job is to run pass routes and get open for a pass, although they are occasionally called on to block. Wide receivers generally line up split "wide" near the sidelines at the start of the play. Wide receivers, like running backs, come in different varieties depending on exactly where they line up. A wide receiver who is directly on the line of scrimmage is called a "split end", and is counted among the seven required players on the line of scrimmage. A wide receiver who lines up behind the line (and thus counts as one of the four backs) is called the "flanker". A wide receiver who lines up between the outermost wide receiver and the offensive line is said to be "in the slot" and is called the "slot receiver" or "slotback". Tight ends play on either side of, and directly next to, the tackles. Tight ends are considered hybrid players, something between a wide receiver and an offensive lineman. Because they play next to the other offensive linemen, they are frequently called on to block, especially on running plays. However, because they are eligible receivers, they may also catch passes. The position known as the H-back is a tight end who lines up behind the line of scrimmage, and is thus counted as one of the four "backs", but otherwise his role is similar to that of other tight ends. 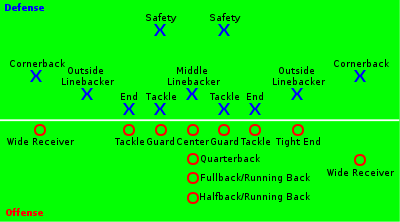 Depending on the style of offense the coaches have designed, the game situation, and the relative skill sets of the players, teams may run formations which contain any number of running backs, wide receivers, and tight ends, so long as the mandated "four backs and seven on the line" rule is followed. For many years, the standard set consisted of the quarterback, two running backs (a tailback/halfback and a fullback), two wide receivers (a flanker and a split end) and a tight end. Modern teams show a wide variety of formations, from a "full house" formation with three running backs, two tight ends, and no wide receivers, to "spread" formations featuring four or five wide receivers, sometimes without any running backs. The I formation is one of the most common. Sometimes called a defensive guard, defensive tackles play at the center of the defensive line. Their function is to rush the passer (if they can get past the offensive linemen blocking them), and stop running plays directed at the middle of the line of scrimmage. The most interior defensive tackle who sometimes lines up directly across from the ball (and therefore is almost nose-to-nose with the offense's center) is often called a nose tackle or nose guard. The nose tackle is most common in the 3-4 defense. Most defensive sets have one or two defensive tackles. If one employs a second defensive tackle, sometimes called an under tackle, he is usually a bit faster than the nose tackle. 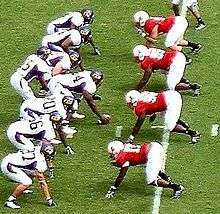 Often, though not always, a defensive lineman will have his "hand(s) on the ground," in a three- or four-point stance before the ball is snapped; this distinguishes his pre-snap stance from a linebacker, who begins in a two-point stance (i.e. without a hand touching the ground). This defense (in white) is in a base 4-3 set. Just behind the four defensive linemen (whose hands are on the ground) are three linebackers (numbers 55, 3 &16), and further back are two safeties (numbers 24 & 44). Out-of-frame are the two cornerbacks. Outside linebackers are given different names depending on their role and the philosophy of the team. Some teams keep their outside linebackers on the same side of the field at all times, and thus they are known as "right outside" (ROLB) and "left outside" (LOLB). Some teams define them by their role; as playing either "strongside" (SLB) or "weakside" (WLB). The strongside, or "Sam", linebacker lines up on the same side as the offensive tight end and often is responsible for covering the tight end or running back on pass plays. The weakside, or "Will", linebacker lines up on the side of the offensive line without a tight end, and is often used to rush, or blitz the quarterback, or may need to cover a running back on pass plays. Defensive backs, also known as the "secondary", play either behind the linebackers or set to the outside, near the sidelines. Defensive backs are primarily used to defend against pass plays. Defensive backs also act as the last line of defense on running plays, and need to be able to make open field tackles, especially when the ball carrier has gotten past the other defenders. A normal complement of defensive backs includes two cornerbacks and two safeties, though specialty defensive backs (nickelbacks and dimebacks) can be brought in in place of linebackers and defensive linemen, when there is need to cover additional pass receivers. Typically two players primarily cover the wide receivers. Cornerbacks attempt to prevent successful quarterback passes by either swatting the airborne ball away from the receiver or by catching the pass themselves. In rushing situations, their job is to contain the runner, either by directing him back to the middle of the field to be tackled, by tackling him themselves, or by forcing him out of bounds. In certain formations, the defense may remove a linebacker or a defensive lineman to bring in extra pass coverage in the form of extra defensive backs. A formation with five defensive backs is often called a "nickel" formation, and the fifth (extra) defensive back is called a "nickelback" after the U.S. nickel coin, a five-cent piece. By extension, a formation with a sixth defensive back is called a "dime package", a 10-cent dime coin being "two nickels (nickelbacks)." Rarely, a team may employ seven or eight defensive backs on certain plays. A placekicker (Mason Crosby, #2) prepares to kick the ball from the hand of a holder (Jon Ryan, #9). Also called the "placekicker", he handles kickoffs, extra points, and field goal attempts. All three situations require the kicker to kick the ball off of the ground, either from the hands of a "holder" or off of a "tee". Some teams will employ two kickers: one kicks extra points and field goals, and the other kicks kickoffs and occasionally long field-goal attempts. Most however use a single kicker for both jobs, and rarely, the same player may also punt. Usually positioned 7-8 yards from the line of scrimmage, he holds the ball for the placekicker to kick. The holder is often a backup quarterback or a punter because of their "good hands", feel for the ball and experience taking snaps from the Long Snapper during plays from scrimmage. A holder is occasionally used on kickoffs if the weather or field conditions repeatedly cause the ball to fall off the tee. A specialized center who snaps the ball directly to the holder or punter. This player is usually distinct from the regular center, as the ball often has to be snapped much farther back on kicking plays. Usually lines up 15 yards behind the line of scrimmage (this distance has to be shortened to avoid being on or behind the end line). The punter, upon receiving the snap, drops the ball and kicks it from the air. This is usually done only on fourth down, and is done to relinquish possession to the defensive team as far downfield as possible. Kickoff specialists are exclusively used during kickoffs. Teams employ kickoff specialists if they feel neither their kicker or punter is good enough at kicking off. Due to their specialized nature, they are rare. Returners are responsible for catching kicked balls (either on kickoffs or punts) and running the ball back. These are usually the fastest players on a team. Teams may use the same player for both positions, or may have a separate returner for punts and for kickoffs. Typically a Running Back, Wide Receiver or Defensive Back. A blocking back who lines up approximately 1-3 yards behind the line of scrimmage in punting situations. Because the punter plays so far back, the upback frequently makes the line calls and calls for the snap to be received by the punter. Their primary role is to act as the last line of defense for the punter. Upbacks may occasionally receive the snap instead of the punter on fake punts, and normally run the ball but may throw it. A player on kickoffs and punts who specializes in running down the field very quickly in an attempt to tackle the kick returner or the punt returner unless the kick returner waves for "fair catch". They usually line up near the sidelines where there will be fewer blockers and thus allow them to get down the field quickly. Jammers try to slow down gunners during punts so that punt returners have more time to return punts.